Just a poem? A love letter? UPDATE: A good friend and music nerd let me know that these are song lyrics. Sammy Cahn was inducted into the Songwriters Hall of Fame in 1972, and took over the presidency of the Hall of Fame when Johnny Mercer became ill. During his career he was nominated for 26 Oscars for Best Original Song and won four times. He is the front runner in Oscar nominations, Johnny Mercer trails him by 8 nominations. He’s in a four-way tie for most awards with Alan Menken (Disney’s personal hit-writer with Under the Sea, Beauty and the Beast, A Whole New World and Colors of the Wind), Johnny Mercer (Moon River, which happens to be one of my favorite songs) and composer James Van Heusen (winning alongside Cahn for all but three of Cahn’s awards, but won on his own for Swinging On A Star). Nineteen Sixty’s the year for his high hopes. Kennedy, he just keeps rollin’ along. The title of the Sinatra film? A Hole in the Head. YIKES. Back to the suitcase. 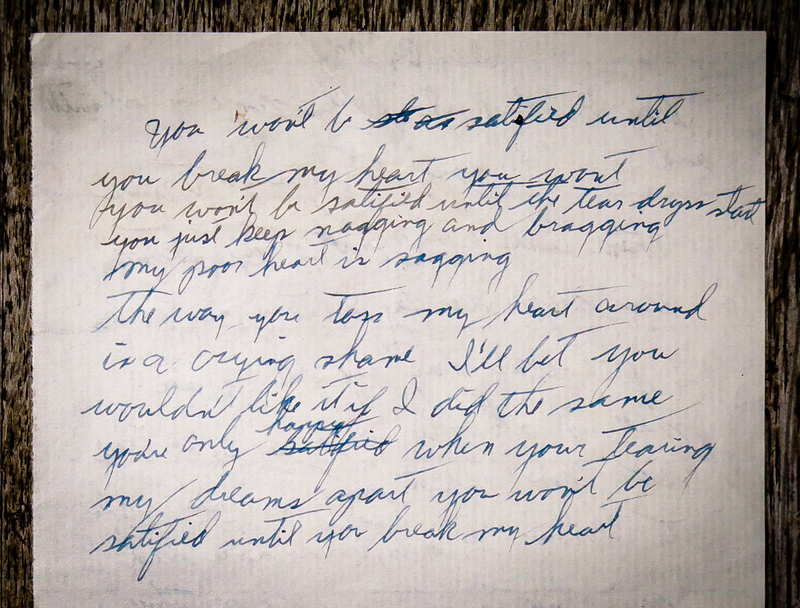 The lyrics for Day by Day are handwritten on a flimsy sheet of cream colored paper, with a rough edge on the right hand side. The rough edge could mean this page was torn from a notebook or the page is half of a standard full size sheet of paper. I think it’s the former, as the watermark on the paper is horizontal, instead of running the length of a full sized page. There is writing on both sides of the page. If it’s from a notebook, that means chronologically, the other side was written first. These are song lyrics, too – I put forth a bit more effort and googled the words this time. “You Won’t Be Satisfied (Until Your Break My Heart)” was published in 1946. The first recording featuring Doris Day and the Les Brown orchestra landed on the Billboard Best Seller chart on Valentine’s Day, where it stayed for 9 weeks. What does this tell us? We now know the writer didn’t originally pen these lyrics. Our mystery man was 34 years old when these songs were released, too old to be practicing his handwriting…if in fact these notes were written by John. The only other handwriting sample I have is a letter from his mother, which is written with the same spidery flourishes, yet has the mark of an older, arthritic hand. Back to the artifact at hand, why copy down song lyrics? Oh wait…I used to do that. I know why. During a particularly melodramatic period in college, I divided my time between listening to Radiohead’s OK Computer on repeat and mooning over my passionate, yet secretive boyfriend. The two were intertwined mentally and physically. I remember a dull class on a grey Monday. My boyfriend was truant. He had gone home over the weekend to visit his “family “, an innocent reason, although my jealous, twisted heart had tacked on: and ex-girlfriend. I feared the worst. Not a grisly death somewhere on the slick 73 mile stretch of I-40 between Chapel Hill and Greensboro, but rather a passionate reunion between the ex and my beau. Maybe you have also experienced this type of electrifying anguish. Perhaps, then, you will forgive me for then scribbling down the lyrics from Paranoid Android in the margin of my American History notes. I know, I know…but it resonated. Maybe my mystery writer had a similar moment. The stories in Day by Day and You Won’t Be Satisfied couldn’t be more different. The former is a saccharine-sweet profession of love, a promise of many blissful years ahead. The latter, the tale of a beat-up heart sick from years of “naggin’ and braggin’”. I will never know what prompted someone to copy down these lyrics, but I’m glad of the memories they unfolded. For what it’s worth…he had gone back to his ex. Their ongoing relationship was a carefully guarded secret until it all went to hell one night after she followed him back to our shared dorm. That confrontation landed him a black eye that stayed around for a week. Have you ever copied down song lyrics for your own wistful reasons? If you feel so inclined, share in the comments. You’ve probably already figured this one out, but if not, these are the lyrics to “Day by Day” most known by Frank Sinatra. Great song. Maybe this guy was a writer? It was written in the 40’s, but didn’t really get popular until the 60’s when Sinatra recorded it. Well, good grief! I’m embarrassed that I didn’t recognize it. That makes it even more interesting…I wonder why it was written down? On the other side of the page is a verse from You Won’t Be Satisfied (Until You Break My Heart). I will update the post! Also…it’s exciting that the first comment on this blog was a “clue-solver”…I hope to have many more. Thanks, lady!